Bedroom 2 has a superking sized double bed, (6ft wide, 6ft 6″ long) so is good for tall people, or those who like plenty of space in bed! 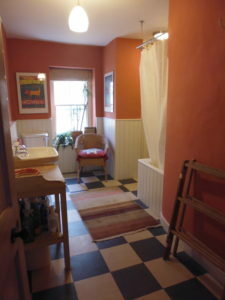 It shares the adjacent large bathroom, with bath & shower, with Room 3. This handmade solid ash bed, is custom made to split into two long singles, if you want to rent the room as a twin. 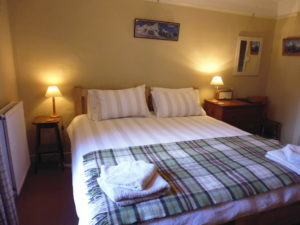 To see prices and check availability of all rooms click here. Special price for longer stays – if you stay longer than 3 consecutive nights, we will take 5% off your bill. Use code Long Stay Discount on the booking form. 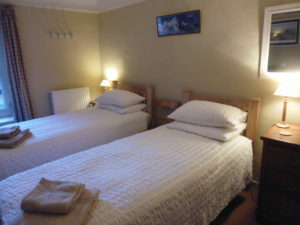 All of the rooms have tea and coffee, kettle and cups, hairdryers and hot water bottles as well as free fast broadband WIFI. This room has a smart TV which works from the internet, so you can watch Iplayer, Youtube etc. Breakfast – all room rates include a plentiful breakfast of tea, coffee, fresh fruit juice, home made bread and preserves, organic yoghurt and cereals, fruit and croissants. A range of cooked breakfast options, using the best local and free range produce, are also available for a supplement of £2-3 per person.